Slick Riches, a slot game developed by Novomatic, is as exciting and lucrative as it is drilling for oil! Unfortunately for the environment, this slick liquid is what makes the world go around and is highly-prized amongst us earth-dwellers! With symbols and a background filled with oil drums, rigs and tools – this slot game will have you dreaming of becoming an engineer and spending your time looking for this rare and expensive liquid fuel! Slick Riches is crammed full of bonuses and special symbols to help slick the way to riches! This is a perfect game for regular slots players who are looking for something different and exciting. Players who enjoy other Novomatic slots like: Book of Ra Deluxe, Secret Elixir and Lava Loot will enjoy this slot game. There are plenty of slick and unique symbols in this richly-designed slot game and every one of them has been nicely designed. From the lowest paying symbol to the very highest-paying one, there is: the monkey wrench; the yellow hard hat; the drum overflowing with oil; the stack of cash; the big drill; the ship; the oil rig; the power station; the rich man; the slick riches symbol; the Wild symbol and the tower; and the drill bit itself. The Wild symbol substitutes for all other symbols except the tower and the drill bit. The tower is the Expanding Wild symbol and the drill bit is the Bonus symbol. The Wild symbol in Slick Riches slot game can substitute for all other symbols except the tower (the Expanding Wild) and the drill bit (the Bonus symbol). The Expanding Wild symbol can substitute for all other symbols except the drill bit (the Bonus symbol) and when this lands on the reels, it expands up and down to cover the whole reel and give you more wins! The drill bit is the Bonus symbol and if you spin three or more of these, you’ll trigger the feature which is 7 free games! The feature is in two parts. First, you’ll be taken to a drill site and you’ll need to pick your drill site! Each time you make a choice, you’ll add either more free games, multipliers to your wins or more Wilds! Then after this, you’ll play the total number of free games you’ve won (7 plus anything more you drilled) and your wins will be multiplied by the number you drilled! These free games can end up giving you seriously big wins! 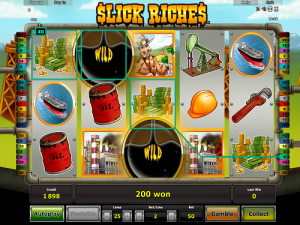 Drilling for wins in Slick Riches slot game is much easier than drilling for oil! It’s simple: spin three or more identical symbols on a payline, on consecutive reels from left to right. This slot game has 5 reels and 25 paylines, any number of which you can choose to have active. Payouts will be bigger or smaller depending on the symbol’s worth and your bet per line, which you can alter as long as you’re not playing in ‘autoplay’ mode. This mode spins the reels for you – absolutely no clicking (or drilling) necessary! As long as you’re not playing in this mode, you can also gamble your wins! After you get a payout, just click ‘gamble’ for your chance to double it and more! Here at NovomaticCasino.co.uk, we have plenty of exciting and lucrative games for you to drill down for and discover! We’ve got all the best Novomatic slots, table games and live casino games which you can play for free! The most popular games are: Book of Ra Deluxe, Dolphin’s Pearl Deluxe and Lucky Lady’s Charm Deluxe. The live casino is also much-loved as it gives players the most spellbinding online casino experience every time they play!